Enough with the partisan politics. The Supreme Court deserves better. David H. from Austin, TX signed. Someone from Rocky Point, NC signed. Richard E. from Andover, MN signed. What is the matter with you people????? Confirm the man then return to your desks and get some work done, please!!! Dems are in trouble in 2018. A busted party that has no meaning. Vernon D. from Henderson, NV signed. Those who vote against Judge Gorsuch need to think twice, if not come mid term elections the voters will. FYI Democrats and Republicans. Donna G. from Baldwin Park, CA signed. Please confirm Judge Neil Gorsuch! Please work together!!! Jerry Z. from Albuquerque, NM signed. Gorsuch is the best. Stop all of the partisan foolery and vote for him!!! William W. from Fenton, MO signed. Someone from Parkton, MD signed. We the People are sick and tired of the games you people play in Congress! 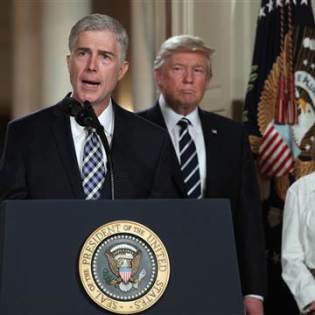 Vote for Judge Gorsuch now and get on with the business we elected YOU to do!! ROBERT W. from Sanford, MI signed. Fred K. from Harrison, TN signed. To malign such a man of character reveals the total lack of morals/common sense/decency (pick one or all) in today's Democrat party. Almost by the day, they prove they are not worthy of the privilege to govern Americans in any significant way. Derek C. from Vancouver, WA signed. Carol A. from Oshkosh, WI signed. This is elitist obstructionist politics at its most obvious. Sadly the insiders think we don't see what is happening. Worse the media report on the horse race not the merits of the candidate. Judge Gorsuch is well qualified to fill vacancy on Supreme Court. Strongly support his confirmation. Democrats have no reason other than obstruction to vote against Gorsuch. Confirm or NUKE. marie b. from Sterling Heights, MI signed. Someone from Holden, LA signed. Randy J. from Castle Rock, CO signed. When are those of you who appose everything that comes before you from this administration going to realize that you are dooming yourselves to ever be voted back in to your positions. We who voted for this President and Vice President take issue with your actions because you aren't just denigrating our choices but you are also denigrating those of us who voted for them. Did you notice how many of us finally stood up to tell you we've had enough! The reason? We have finally admitted that you are there only for your own gain. You don't worry about your folks back home. Get our Supreme Court up to par now. We want Judge Gorsuch confirmed as soon as possible! You make me ashamed that I was ever a democrat. Susan S. from Barnhart, MO signed. This man was unanimously confirmed before what makes this time so different? Hypocrisy prevails on the left and the right. You folks need to figure out you are neither better or smarter than than we the voter. It's a brave new era; I for one have had enough of the continual posturing that only satisfies you personal agenda. I do not know who ms.Claire McCaskill speaks to, but it has not been a sober minded conservative. With my two Senators (California, Feinstein and Harris), no amount of petitions will make any difference. These democrats just will not relent! Please confirm Judge Gorsuch to uphold the U.S. Constitution for all American citizens. This man was unanimously confirmed before what makes this time so different? Honestly I know the answer and shame on those blocking this confirmation. HE WILL BE AN ASSET TO THE SUPREME COURT. William C. from Kansas City, MO signed. I vote to DEMAND THAT OUR COUNTRY NEEDS SUCH A WONDERFUL MAN AND URGE ALL REPUBLICAN SENATORS USE YOUR VOTES AND GOOD SENSE TO VOTE YES AND CONFORM TO BE OUR JUDGE NEIL GORSUCH TO THE SUPREME COURT.